I am very happy to be in the midst of all of you. I feel very blessed to be here at Bodh Gaya. 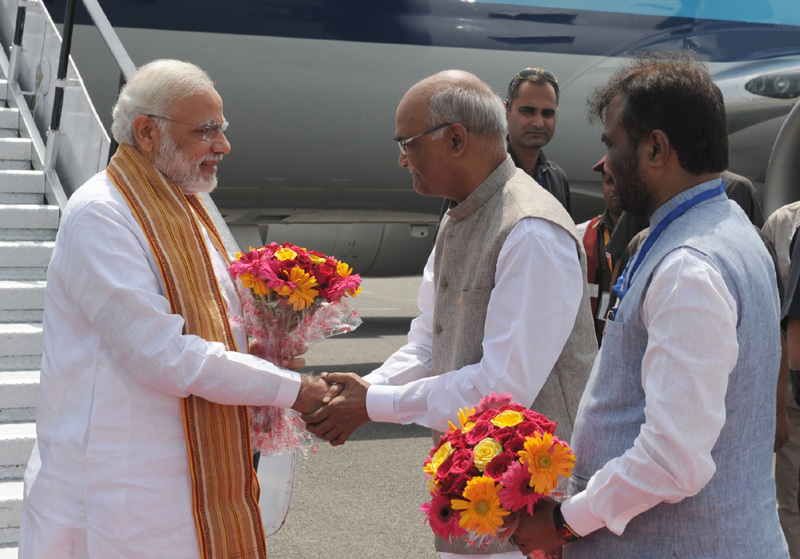 After Pandit Jawaharlal Nehru and Atal Bihari Vajpayee, I have the opportunity to visit this sacred place. I am meeting you all on a very special day. Today, we in India are observing Teachers’ Day, to commemorate the birth anniversary of our 2nd President, a great scholar and teacher, Dr. Sarvepalli Radhakrishnan. In this symposium we have been talking about one of the most impactful teachers in world history, Gautama Buddha. His teachings have inspired millions of people over centuries. Today, we are also celebrating Janmashtami, the day Lord Krishna was born. The world has so much to learn from Lord Krishna. When we talk about Lord Krishna we say, श्री कृष्णम वंदे जगतगुरुम -Shri Krishna, the teacher of all teachers; the Guru of all Gurus. The two day conference seems to have arrived at a broad consensus on both issues. On the issue of conflicts — most of which are being driven by religious intolerance — the participants in the conference seem to have agreed that while there is no problem about the freedom to practise one’s religion, it is when the radical elements try to force their own ideologies on others, that the potential for conflict arises. On the issue of environment, the conference seems to have agreed that the philosophic underpinning of the Dharma, which stresses the protection of natural heritage, is critical for sustainable development. I may add that the United Nations too has arrived at the view that sustainable development is achievable only through aligning development to the local culture of the people. This, in my view, is a positive turn in the development modelling of the world of diversity. I may add that the turn in thinking at the global level has created the eco-system for the Hindu-Buddhist societies to carry forward their consensual ideas to the global fora. I personally consider the Hindu Buddhist Conference on Conflict Avoidance and Environmental Consciousness as an important development in a world that seems to be short of durable ideas on both issues. Hindu philosophy was one of the greatest beneficiaries of the advent and the teachings of the Lord Buddha. Many scholars have analysed the impact of Buddha on Hinduism. In fact, Adi Sankara was even critiqued for the way he was influenced by the Buddha and Sankara was called as “Prachhanna Boudha” — meaning Sankara was Buddha in disguised form. That was the extent of influence of the Buddha on Adi Sankara, regarded by many as the tallest Hindu philosopher. At the mass level Buddha was so venerated that Jayadeva in his Geeta Govinda even praised him as Mahavishnu or God himself who descended to preach Ahimsa. So, Hinduism after the Buddha’s advent became Buddhist Hinduism or Hindu Buddhism. They are today an inseparable amalgam. This is how Swami Vivekananda praised Buddha. At the time Buddha was born, India was in need of a great spiritual leader, a prophet. Buddha never bowed down to anything, neither Veda, nor caste, nor priest, nor custom. He fearlessly reasoned so far as reason could take him. Such a fearless search for truth and such love for every living thing the world has never seen. Buddha was more brave and sincere than any teacher. Buddha was the first human being to give to this world a complete system of morality. He was good for good’s sake, he loved for love’s sake. Buddha was the great preacher of equality. Every man and woman has the same right to attain spirituality— that was his teaching. I would personally call India Buddhist India as it has imbibed all the values and virtues of the teachings of Buddha by their religious scholars incorporating them in their literature. When this highest tribute is paid by one of the great Hindu philosophers would it be wrong to call today’s Hinduism in quality and substance as Buddhist Hinduism? 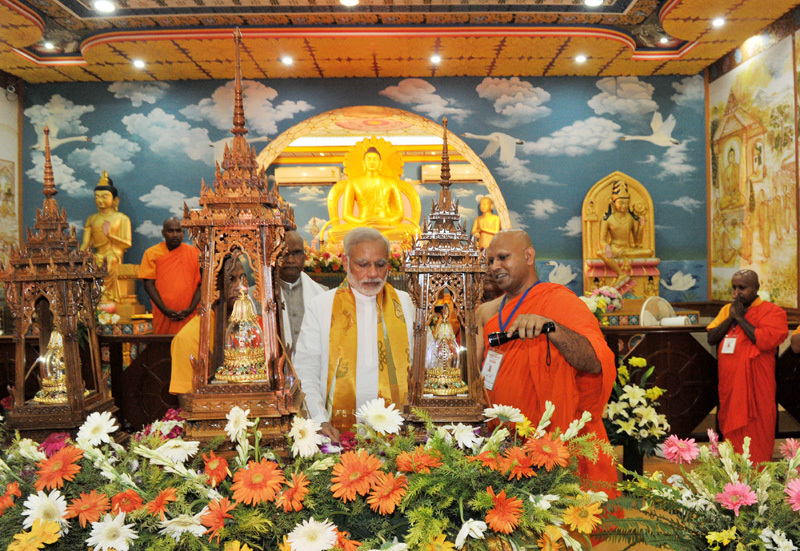 Buddha is the crown jewel of the Indian Nation which accepts all ways of worship of all religions. This quality of Hinduism in India was a product of many great spiritual masters chief among them was Buddha. And this is what sustains the secular character of India. The Enlightenment which Buddha attained in Bodh Gaya also lit the light of enlightenment in Hinduism. As the first Servant of this ancient nation I revere Buddha as a reformer of not only Hinduism but also the world, who has given all of us a new world view and vision which is critical for the survival of all of us and the entire world. 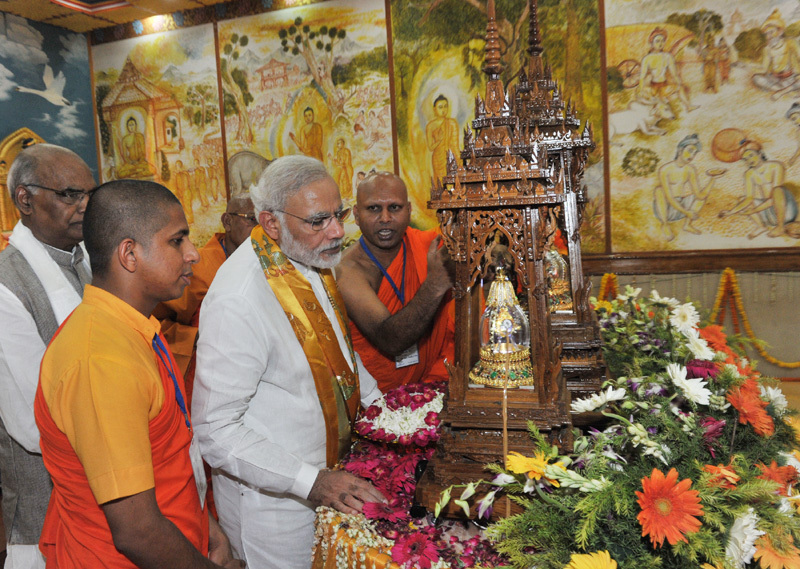 I recognise how Buddhists all over the world revere Bodh Gaya as a place of pilgrimage. 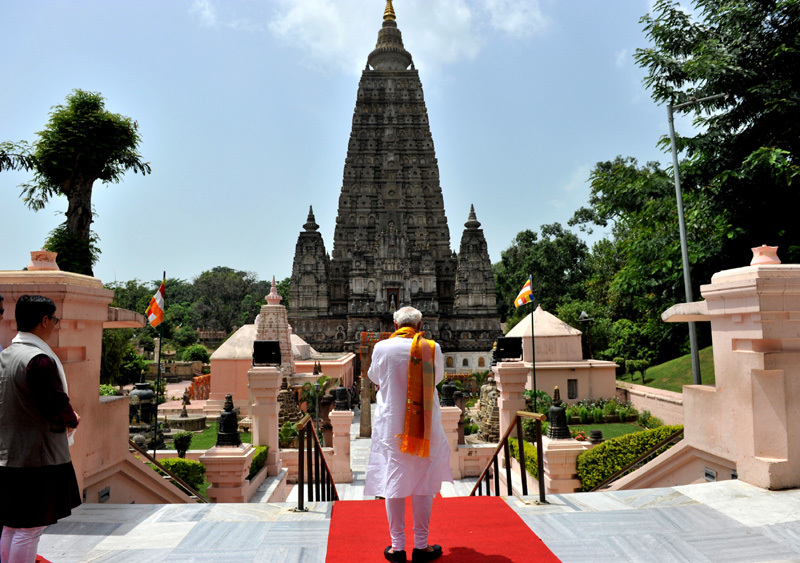 We in India would like to develop Bodh Gaya so that it can become the spiritual capital and civilisational bond between India and the Buddhist world. 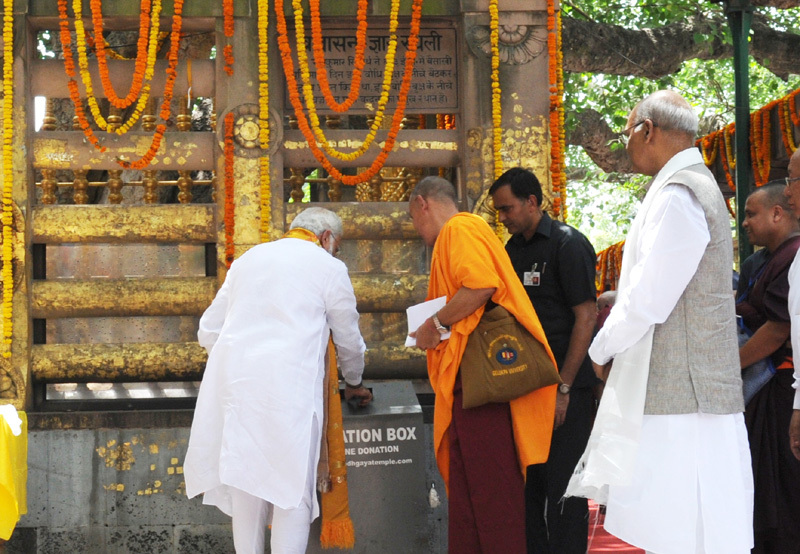 The government of India would like to provide all possible support that its Buddhist cousin nations need for the satisfaction of their spiritual needs from this holiest of holy places for them. I am happy to read the Declaration of Buddhist Religions and Spiritual Leaders. This declaration is the result of hardwork and extensive dialogue, which is why it is a pioneering document that will show us the way ahead. I also echo Prime Minister Shinzo Abe of Japan, who the other day highlighted the importance of tolerance, appreciation of diversity, and spirit of compassion and fraternity. His message to this august gathering and his continuous support for furthering this initiative is a matter of great strength for us. Once again, my congratulations and best wishes to you all. This conference has raised a hope and urge to go beyond clash and create a dialogue framework for civilizational harmony and world peace. I wish you well in your constant and determined efforts to ensure that our wisdom reaches the future generations and that too in a manner in which they can practically relate to. This is essential not for us or them but for the progress of the entire human race and the beautiful surroundings which we have got from Mother Nature.